And Gotham does it again: take a great villain (and a great performance by the actor playing said villain) and wraps the story quickly. It's almost a shame, since Nathan Darrow is probably the best version of Mr. Freeze I've ever seen (apologies to George Sanders, Otto Preminger, and Eli Wallach...I confess to liking Preminger's the best, and the less said of Arnold Schwarzenegger the better). A Dead Man Feels No Cold doesn't eliminate Mr. 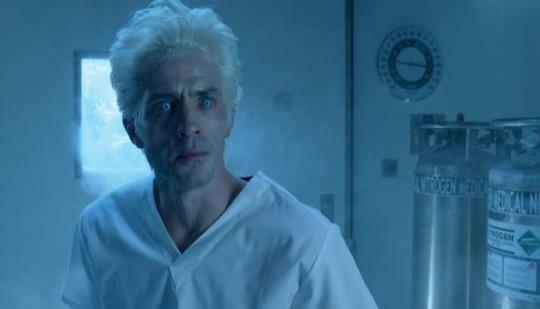 Freeze completely (how could it, given he will eventually have to confront the future Batman), but I wish they had let him escape to fight another day rather than be roped in by the more villainous Dr. Strange. Oh well, one can't have everything. Detectives James Gordon (Ben McKenzie) and Harvey Bullock (Donal Logue) are on the hunt for Victor Fries aka Mr. Freeze (Darrow), who is determined to get his dying wife Nora (Kristen Hager) back. Nora is taken to Arkham Asylum's medical facility as a way to both keep her alive and trap Fries. Victor however, quickly sees through this scheme and plots his own plan to bust his wife out. He manages to succeed thanks to the secret help of Dr. Hugo Strange (B.D. Wong), the chief psychiatrist at Arkham who has nefarious plans of his own. Part of this means allowing Fries to leave with his wife and her physician, Dr. Leslie Thompkins (Morena Baccarin), over Gordon's objections. Gordon is worried for both Lee and their unborn baby, but Lee tells him she will go. Back at the Fries home, Nora realizes that her husband, while a good man, has killed too many people to save her. She secretly switches the cartridge that holds the successful formula with another, and when Fries freezes her to save her, she disintegrates instead. Victor, so horrified and devastated when he realizes the truth, attempts to freeze himself. To the public, Victor Fries is dead, but we learn that Strange has saved him, for he is useful...perhaps in bringing back such characters as Jerome and Theo Galavan (and maybe a certain dead Fish). 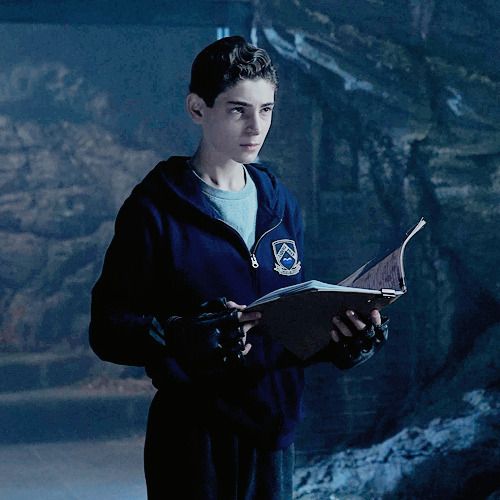 Meanwhile, in two other subplots, young Master Bruce Wayne (David Mazouz) is coming closer to finding Matches Malone, the man who killed his parents. His mind is becoming set on revenge by killing Malone. His manservant Alfred (Sean Pertwee) is dead-set against Bruce doing any killing and reaches a compromise: Bruce and Alfred will search out for Malone, but Alfred will kill him. Bruce however, is starting to fill with bloodlust, and asks his frenemy Selina Kyle (Camren Bicondova) to get a gun. She too tells him he's not made of such stuff, but Bruce will not be denied. Back at Arkham, Oswald Cobblepot (Robin Lord Taylor) is being tortured by Dr. Strange, the bad doctor's efforts to alter him meeting with little success. Cobblepot begs Gordon's help but Gordon does not want to get involved, thinking Strange isn't so...well, strange. An enraged Cobblepot screams about Gordon being Galavan's real killer, which catches Strange's attention. A Dead Man Feels No Cold has some of the best acting going on, which is a highpoint of both the episode and the series. At the top of the list is Nathan Darrow as Victor Fries/Mr. Freeze. Darrow brings a complexity to the role, making Victor a good man driven to desperate ends for a noble cause. He makes Mr. Freeze into a believable character, a remarkable feat given the outlandish nature of character. Darrow is sympathetic as Victor, and it makes his journey a sad one. Moving on, I was so impressed with Mazouz as Bruce Wayne. He is in turns cold and filled with rage and he plays both sides with aplomb. His cool, eerie conversation with Thompkins gives us the strongest suggestion that Batman is rising, and the anger about going after his parents' killer is chilling (no pun intended). Has Robin Lord Taylor ever given a bad Penguin? I don't think so, and here, watching him puzzled by a game of Duck, Duck, Goose is sad and makes one feel for someone who is if not crazy at least murderously psychopathic. Given all that, why am I not as enthused about A Dead Man Feels No Cold? I think it comes from the fact that the Freeze storyline went by so fast. I think it comes in the parallels between Nora and Lee, both in love with men whose obsessions, while for the good, lead them and others to ruin. Oh, and Gotham could not resist getting in a touch of the gruesome: a literal icicle (as in 'eye'-cicle). As if seeing Nora's disintegration wasn't gruesome enough...or Mr. Freeze's fright-wig. A Dead Man Feels No Cold was elevated by Nathan Darrow in particular, but brought down slightly by a quick finish to what could have been an interesting story. It also brought us the potential of bringing back other characters, which is curious way of having your cake and eating it to with regards to the Rogue's Gallery. 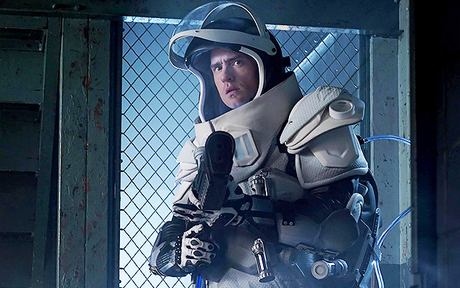 Still, good performances and a strong action piece in the Arkham raid makes this another excellent Gotham episode.